Agile software development owes quite a debt to The Toyota Way, AKA Lean manufacturing. While Lean principles have lead to tremendous savings in the world of producing material goods, it was uncertain how the principles apply to software development. Furthermore, there seemed to be a bit of a gap regarding how managers relate to Agile teams. Enter Tom and Marry Poppendieck, and their "An Agile Toolkit for Software Development Managers". In one concise, readable, usable volume they managed to teach the application of lean principles to software development in a way that is useful for managers. As explained in the book, the main challenge was in translating basic concepts. 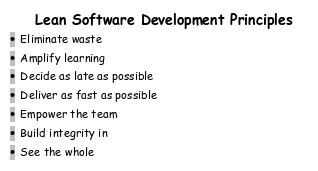 In order to reduce waste, one has to learn to see waste in software development. It takes the same basic forms of rework, wait-states, work-in-progress, etc. As we work through Lean Software Development, we learn again to be courageous in simplifying our work lives. We learn to do one thing at a time. We learn to stop half-doing work to pick it up again later. A surprising bit is "decide as late as possible" -- deferring decision making until the latest responsible moment. It is quite obvious once one has begun to apply it, but goes against the type-A intuition. Rather than deciding more things up front and sticking to our guns, we are told to wait and decide when it is clear which way we should go. This kind of iterative decision-making is at the heart of Agile practices and aids us in making simplifying assumptions. For that matter, we find the same principle at work in well-crafted software in the form of late binding. Building integrity into the product again echoes Deming. The final point, seeing the whole, helps us remember to beware local optimizations that tend to decrease the performance of our organization. A favorite teenage lament is "my life would be easier if everyone else would take better care of me." In a similar vein, we find that optimizing for one group (perhaps the developers, perhaps product group, perhaps management or sales) can cause the organization as a whole to suffer. By seeing the whole, we will take steps that may actually make some peoples jobs a bit more difficult in order to improve the ability of the company to compete.